Compatibility What software platforms are compatible with it? Mobile devices that support Android, iOS and WIndows 10 operating systems. The type of display or screen on fitness trackers varies widely by brand and price point—from a few LED lights to full color touchscreens. The main benefit of a screen is being able to read the time and your fitness stats any time of the day without needing to open an app on your phone or plug the tracker into your computer. This could be a positive or negative—some people prefer not to see progress and feel rewarded when they finally look at results and meet their goal. Others need a constant reminder of their status to push them to reach their goals. It’s totally up to you. Oftentimes, you can also read smartphone notifications on a screen, depending on how advanced the tracker is. Every tracker will differ on what information is shown on the display, whether it’s the time, steps, heart rate, or other goals. Some will be a touchscreen, some will not. These aspects mainly affect ease of use, and will vary in importance by person. Finally, a display will also drain your battery more quickly, and come with a higher price tag. Display Does the tracker have a screen? Touchscreen Is the display a touchscreen? For fitness trackers, batteries vary widely. Some trackers have rechargeable batteries that last anywhere from hours to days. Others take coin cell batteries like you would find a regular watch, which last a few months to a year. Needing to purchase and replace batteries can be a hassle… but so can plugging in your device every five or so days via USB cable to recharge it. Remembering to take the device off, charge it, and then remembering to put it back on, can seriously interrupt your fitness routine, especially if you’re worried you’ll forget it. Plys, if you want consistent sleep tracking, you don’t want to be charging it overnight. Both options have advantages and disadvantages to keep in mind while you compare options. Battery Life How long does the battery last? Additional Features Any other features to note. Rank: #10 out of 585. Fitbit Charge is a very popular and one of the more expensive options. 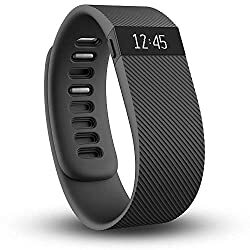 It's in the top 3 bestselling fitness trackers and has dozens of popular alternatives in the same price range, such as Garmin vivofit 3 or Misfit Shine 2 . Fitbit Charge is $26 more expensive than an average fitness tracker ($30.99).